Entrigue Magazine brings you articles on today's music and dance artist, Fashion designers, and rising stars of tomorrow. 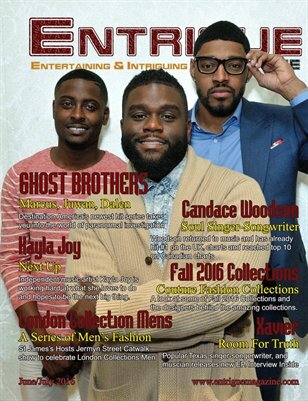 In this issue you'll find an interview with Destination America's newest hit series stars of Ghost Brothers, Marcus, Juwan, and Dalen. Interview with soul singer Candace Woodson, Fall 2016 Collections, London Collection Mens, Jason Derulo, choreographer Anthony Thomas. You'll find these and much more in this issue of Entrigue Magazine.